Hydraulic handling is a type of transport of heavy industrial components provided by sliding the cargo atop sliding beams. 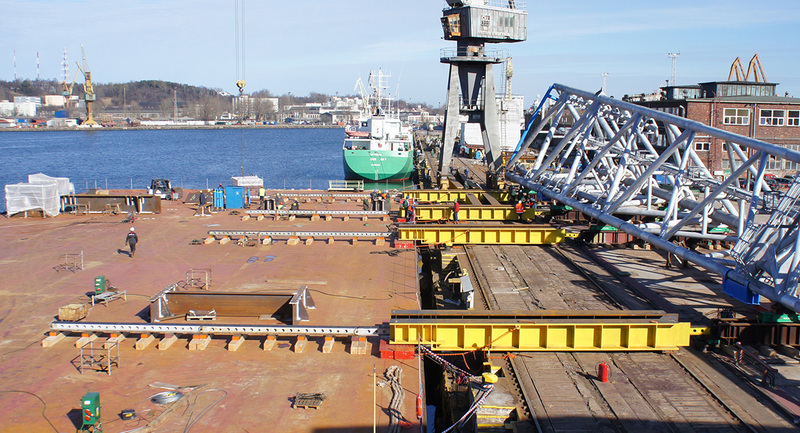 The transport is completed on construction sites, in shipyards, industrial halls, etc. In sea and inland ports, it enables to move heavy loads from the place of assembly to the range of floating and ship cranes, and load on and unload from pontoons. Another important application is use of the system for assembly or disassembly of equipment on their foundations, unloading from wagons or cars. Rigid sliding carts and trolleys with the possibility of hydraulic displacement – enable sliding transport of structures of up to 5000 T.